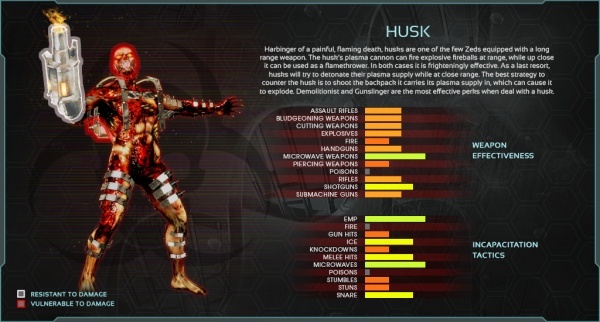 The Husk is an uncommon specimen in Killing Floor 2. It is classified as a medium enemy. 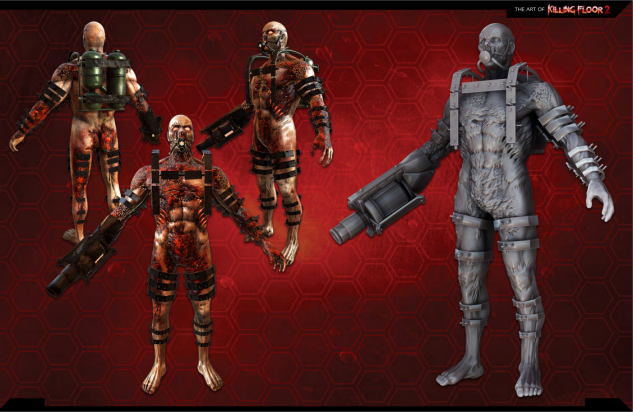 Husks appear as humanoid males with charred skin, usually covered in blood. They have a gas mask stitched to their faces and metal platings strewn about their bodies, as well as a fuel tank strapped to their backs. Their most distinctively feature is their right arm, which has been replaced with a cannon capable of shooting fire. Thus, Husks are one of the few specimens in the game capable of a ranged attack, and are able to dish out insanely high amounts of damage if left unchecked. 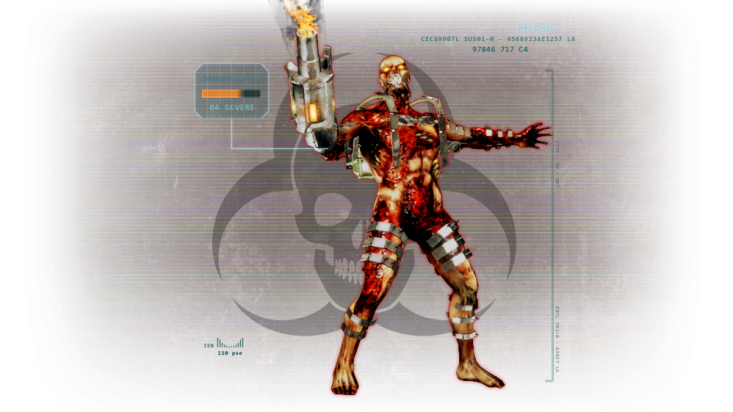 Unlike other enemies, the Husk has a third health value for the fuel tank on its back. Husks will only sprint when their health drops to 15% or if they are frustrated. Should sprint whenever attempting to suicide. Should sprint when frustrated. Husks have one weakness and an array of resistances. 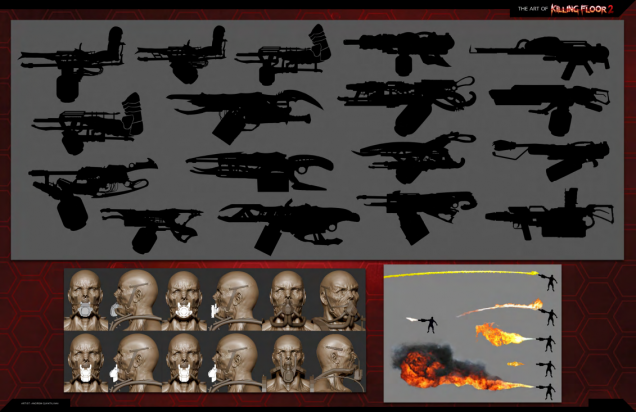 Husks are neutral to shotguns, while being resistance to every other ballistic weaponry. Husks have special resistance values for the 9mm Pistol and Remington 1858 Revolver. Interestingly, the Husk's head is barely a weak spot, yet the fuel tank on its back is much more vulnerable. Their arm cannon deflects attacks. The Husk is a ranged capable, support damage ZED. Upon spawning, it will walk towards the nearest player. Upon sighting the team, they will start to bombard players with their Arm Cannons, shooting fire projectiles that deal splash damage. On Hell On Earth difficulty, the fireballs can set the ground on fire, causing damage to players who step in the fire. The Husk takes a second to wind up the arm cannon before firing. During this time, it leans in such a way that the side of its fuel tank is exposed to the front. This fuel tank is the Husk's real weak spot, not the head. If the fuel tank is successfully destroyed, the Husk will explode violently, killing it and other lesser ZEDs nearby. The fireballs also have knockback power and will cause splash damage at the point where they land, pushing players away from the impact point and dealing minor splash damage. Husks have a short cooldown before they can fire their arm cannon again. Husks are capable of tracking players and leading their shots while they are taking aim. Moving in a straight line will get you hit; Instead dodge in zig-zags. Husks walk slowly until their HP drops to 15% or lower, at which point they begin to sprint at players. Depending on difficulty, the Husks' behavior in close range changes. 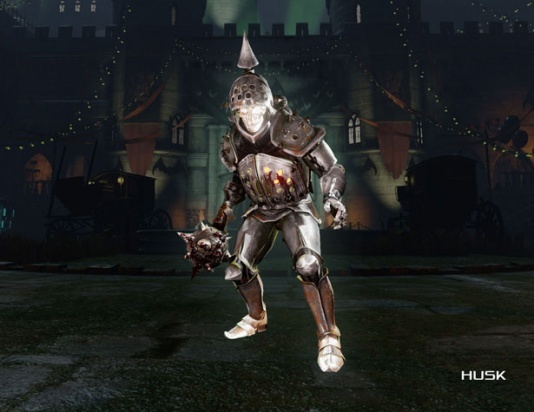 On Normal and Hard, Husks will attempt to bludgeon players with their armored arm cannon and claw at them in melee range. On Suicidal and Hell On Earth, Husks will instead use their arm cannon to spray fire, like a Flamethrower. This attack deals massive damage in a cone, and the damage fluctuates based on proximity; Generally, the closer you are to the Husk, the more damage you take. Players or ZEDs hit by the fireball or Flamethrower will be set on fire and take potent damage over-time for a few seconds. On all difficulties, Husks can perform a suicide explosion attack by pointing their arm cannons at the ground and blowing themselves up at melee range. This deals massive damage (190) and will kill anyone short of a Demolitionist with explosive resistance. The higher the difficulty, the more likely Husks will choose to suicide instead of meleeing. (PvP) Rally boost: forces AI Husks to sprint, players do x1.2 more damage. Damage to doors = 30. Fireball attack intervals Normal - 5s / Hard - 4.5s / Suicidal - 4s / HOE - 3.5s. Stumble power (Fireball explosion) = 150. Fireball attack intervals can be deviated by up to -1s / +1s. Flamethrower attack has splash radius (300 units) where it does 1 point of damage (no falloff). Flamethrower damage scales from the maximum to the minimum over the range of attack. Husk will attempt to suicide when its HP will be at 15% of the base value. Husk will suicide when it will be at least 280 units away from the player location. Husk will use its flamethrower if player get closer than 500 units. Minimum time between Flamethrower attacks is 5 seconds. Fireball and Flamethrower attacks can be interrupted. Distance from the player for Fireball attack: minimum - 3m, maximum - 40m. 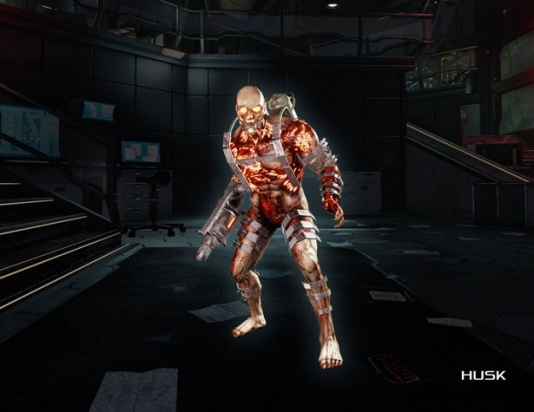 EMP effect (disrupt) prevents Husk's fireball and flamethrower attacks. Explosion triggered by shooting Husk's backpack does the same amount of the damage, has the same radius and falloff as its Suicide explosion attack. However it does not damage players. Explosion of the Suicide attack may cause obliteration of ZEDs whose health is low enough to die in this explosion (to obliterate, damage required = 160, ZED health should become at least = -80). Explosion has Knockdown power of 39 and Stumble power or 59. Husk's flame based attacks has Burn power of 2.5. On Suicidal and HOE difficulties Husk's Fireball attack spawn the Ground Fire: Damage - 3, Radius - 1.5m, Falloff - 0 (none), Duration - 4s, Damage interval - 0.5s. Fireball spawns ground fire: Normal - No, Hard - No, Suicidal - Yes, HOE - Yes. In PvP games AI Husks does not spawn ground fire. Fireball pushback force: Normal - 50000, Hard - 55000, Suicidal - 60000, HOE - 65000. In PvP games AI Husks has fireball pushback force of 50000 (the higher value - the more it pushes). Husk's Flamethrower attack spawn the Ground Fire: Damage - 6, Radius - 2m, Falloff - 1 (linear), Duration - 2.5s, Damage interval - 0.25s. DOT (Fireball and Flamethrower Ground Fire): Scale - x0.5, Duration - 5s, Interval - 1s. Husk's fireball attacks are capable of destroying closed unwelded doors in one hit. The Husk is an interesting specimen with multiple behavior patterns and a wide range of attacks, all of which deal extreme damage. 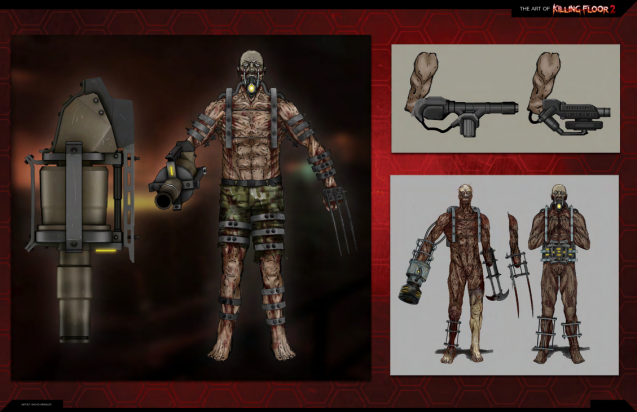 One can look at the Husk as the damage dealer of the ZED line-up. The Husk's fireball can be dodged. Move in a zig-zag to throw off the Husk's aim, and change directions when the fireball is released. Players can jump as well if they get a running start to let the fireball pass through below them. You may still take splash damage when dodging the fireball, but it is infinitely preferred to being hit directly which deals far more damage. Husks should be killed from a distance before they can cause too much damage with fireballs. A player with fast reactions can exterminate them quickly as they begin to charge up their arm cannons for a fireball attack, as they leave their fuel tanks exposed during this small window. Husks are particularly dangerous in wide open areas where there is no cover to break line of sight, and they are able to repeatedly snipe players while the horde keeps the team occupied. The perks most suited for exterminating Husks are the ballistic weapon perks. They are all able to destroy the Husk's backpack in one or two shots quickly; a more skilled player can take out the backpack while Husks are winding up for a shot or spraying fire. If the Husk needs to be exterminated quickly and its fireball attack is cooling down, the head is still a viable weak spot. Killing it via decapitation requires more ammunition, however. The player can then use the headless body as a grenade by shooting the fuel tank before it bleeds out. Do not let Husks get into close range as they are capable of doing a fiendishly high amount of damage; This is especially true for the Flamethrower attack, which can kill the fully armored and healed Berserker in seconds. Only the Firebug has any hope of surviving the Flamethrower at melee range due to their high fire resistance. Likewise, do not let Husks fall below 15% HP. This usually only happens on body shots, as quick kills via decapitation or fuel tank destruction will drop them long before their HP can hit 15%. Sprinting Husks can cause players to panic due to their extreme damage potential. Interestingly though, the Husk is most vulnerable to Shotguns. This is likely to encourage and reward skilled play from Support Specialists, who are daring enough to get close to a Husk and perform a quick decapitation kill while they are winding up for a shot, and before they can finish the attack to use their Flamethrower. Similarly, while the Berserker may have trouble engaging a Husk at close range, their weapons are usually strong enough to take out the Husk's head in one blow. Alternatively, they can go for a trick swing which allows them to use the arc of their weapon attacks to hit the Husk's fuel tank behind them at close range. Failure to kill the Husk at close range will result in an enraged, sprinting Husk who will retaliate with the Flamethrower immediately, which is highly dangerous.